I was woken by intense drumming every morning at dawn inside the tipi I was sleeping in. 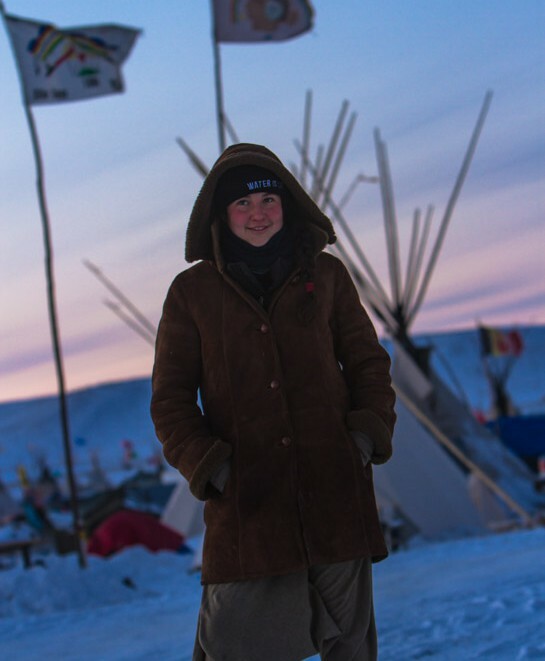 I was staying at the Oceti Sakowin camp, the biggest camp of about four or five that together were fighting the construction of the Dakota Access Pipeline, cutting through native American land, the Standing Rock Reservation in North and South Dakota. There was a sacred fire burning in the centre of the camp, day and night, since the first people arrived there in April. That’s also where the microphone stood through which information and inspirational messages were constantly communicated. And the wake-up call every morning. I would get up, water frozen next to my bed. Nothing to drink or to wash my face. Porter potties – you get used to them. I was there for six weeks and temperatures went down to about -30 degrees, together with the strong winds it reminded me a lot of conditions in Kamchatka. I was mostly working in the kitchen and getting there in the morning was an increasing challenge as the weeks went by and temperatures plummeted. We had to defrost our water and how can you get hot tea and coffee out to people. How to make breakfast. At times all our eggs would freeze over night. The kitchen- called California kitchen, because it was initiated from the native tribe of Hoopa from Northern California- was improvised but over the months became well-equipped. It was a constant process of re-organization as new helping hands entered with ideas of innovation. We served many hundred people a day. All the meals we cooked were donated by people supporting the movement and we had an abundance of supply. Good fresh produce, coffee, grains, dairy products and meat. People would share big pieces of bison, elk or moose from their homelands; or salmon from their rivers and fresh vegetables. Keeping track of donations actually wasn’t always easy and I learnt how important organization is. The kitchen was a great place. All sorts of people from all over the place would walk in and help for a few hours or a few weeks. You got to know each other in a short while like with others after a few years. Because you were working together, living together and you were there to support the native Americans in their fight against the ‘black snake’. I made deep connections with people. There was lots of laughter. And lots of prayer and circles, at least one big one before dinner. There was so much going on in this relatively small space of the kitchen that every day seemed like a whole chapter on its own. The concept of time was different at Standing Rock. After serving dinner and making sure dishes were being washed there was often drumming and songs shared by different natives. This was always an amazing way to finish off the day. People would hold hands in a big circle and we would dance to the beat of the drums, called round dance. I would go to sleep very tired, happy and excited for the next day. Standing Rock is not just a camp demonstrating against the construction of a pipeline. The camp represents a unique gathering of people. A gathering that unites tribes which historically had been at conflict with each other and have now come together to stand up for this cause. It is a place of ceremony and prayer. It is an indigenous led fight and we are there to support, as allies. As invited guest we were reminded to be aware of the history of colonization of this land and to not continue its patterns. Keeping this context in mind as a white person you were invited to step back, observe and listen rather than thinking you have the right solution or tactic. I strongly believe that what was created at this camp has had a big impact on me and will continue to. This camp inspired many people to believe in the influence they can have and to stand up for what they believe in. The camp was very much a magic place. It represents a starting point for many more movements to come: people taking charge, feeling the responsibility to speak up and knowing they will get support. Regardless of the pipeline’s progress, Standing Rock was a wake-up call and the fire continues to burn.